Home Blog Feast of the Transfiguration of Our Lord – Why Me? My favorite thing to do whenever I meditate on the Transfiguration of Our Lord (celebrated on the Roman Catholic calendar August 6) is to put myself in the place of one of the three apostles Jesus chose to accompany him. Our Lord asked Peter, James, and John to come with him to the top of Mount Tabor to pray. While they were praying, a miracle took place– Jesus changed in appearance – and the three apostles were shaken, to say the least. Why did Jesus choose Peter, James, and John to accompany him? Jesus could’ve chosen any of his apostles. In fact, he could have performed this amazing miracle in front of an entire crowd. Instead, he picked three of his closest followers. When I put myself in the place of those apostles, I can’t help but wonder, “why me?” I’m certain that’s what I’d be asking myself if I were in their shoes. Only those three apostles were given the privilege to witness Jesus’ glory; the rest had to wait for the appropriate time to hear about it, and then were left to believe based on the others’ accounts. That’s quite a remarkable responsibility! 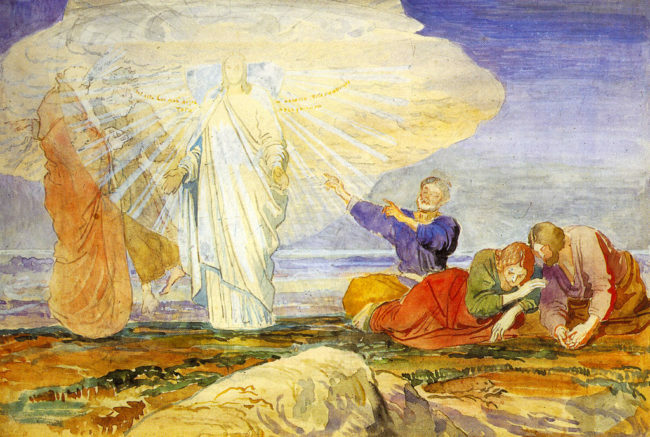 Not only did Peter, James, and John receive the gifts and graces of the Transfiguration directly, but also they were required to keep the whole experience under wraps. Perhaps you’re a whole lot better at keeping fabulous secrets than I am, but as for myself, I would’ve been bursting to tell somebody – anybody. No, I’d have been bursting to tell everybody. Peter, James, and John had seen Jesus’s Transfiguration. They knew what he was capable of. Yet, when the events leading up to the Crucifixion began to unfold, two of them abandoned our Lord and one of them remained. We hear little about James during the Passion, but we know that Peter, the “Rock” on which Jesus would build his Church and who swore he would die with Jesus, ended up denying three times that he even knew him and then disappeared into the periphery when things heated up. John alone held steady, finally standing at the Foot of the Cross as Jesus hung dying. Jesus is God; he knew everything. He knew how Peter, James, and John would act during his Passion and Crucifixion. Since John stood by him – literally – until the very end, I can certainly understand why Jesus chose him. But, Peter and James? Why them? When I compare myself to those three apostles, I think that I more strongly resemble Peter than I do James. And, sadly, I think I seldom resemble John, at least in regard to his perfect faithfulness to Our Lord. More often than I’d like to admit, I fail in being perfectly faithful to Jesus. Yet, I know that he loves me in spite of my brokenness. I know he loves me because I’m privileged to experience his grace in my life. Although I haven’t actually witnessed THE Transfiguration, I have had Transfiguration moments pop up every now and then throughout my life. The point isn’t really what happened. Rather, it’s the awe I experienced as I witnessed the glory of God in my life. As undeserving as I may be, I was given the privilege of tasting the Transfiguration. It’s at those moments that I feel as though I’m one of the apostles atop Mount Tabor. Apostles, Transfiguration. Catholic Church. Bookmark.